Fix your cluttered cabinets, overflowing drawers, and messy living areas with these tips, tricks, and project ideas from Carrie Higgins, the organization expert of the Making Lemonade blog. -Using daylight saving time as a reminder to check the expiration date on the medications in your cabinet. With Organization Hacks, you can get your house in order and turn your home from a hoarding nightmare into a clutter-free paradise! Carrie Higgins is a former teacher and school librarian who has been blogging for over seven years. She has been featured in Country Living, The Good Life with Dr. Oz, The Philadelphia Inquirer, Better Homes and Gardens, House Beautiful, Apartment Therapy, and more. She is the author of Organization Hacks. "An organizing book with you that will help you organize your cluttered cabinets, overflowing drawers, and messy living areas in your home in no time. It seems that we all like to get a fresh start in January and the ideas and solutions in this book will help you do just that. If you are looking for clever ideas for organizing every space in your home, this book is for you." "Are you someone who is always looking for ways to organize your house better? That is why I absolutely love Organization Hacks by Carrie Higgins. Carrie gives great tips for staying organized in your home, which helps me to stay organized in my life also. The suggestions she makes really do help, and they are all so easy to follow." 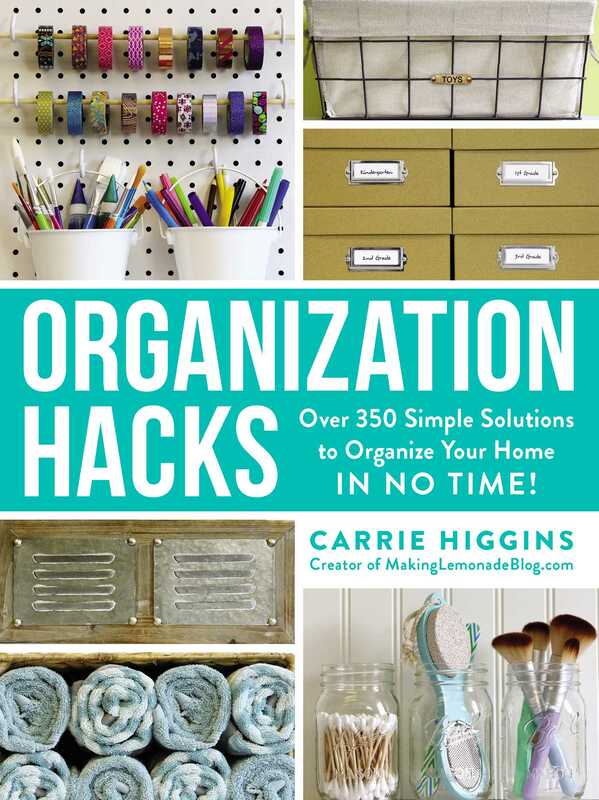 "You’ll find clever ideas and solutions in Organization Hacks … .Carrie Higgins … shows how you can achieve and maintain balance in your home and regain the love you felt when you first moved in." "Tackling our kids’ closets was by far the best take away from Carrie’s book! I was so excited to get my kids’ clothing crisis fixed! These are just a few of Carrie’s tips. She has amazing garage organizational tips for a stylish yet functional garage space." "The book delivers both ideas and DIY projects illustrated by line drawings that will guide you in the right direction. The remedies are not just simple, they are inexpensive. Anyone can bring clutter to its knees. If you feel like your life is out of control, take heart. Here’s the help you need."